Happy Easter Everyone! The gallery will be open over the Easter weekend as usual but then closed next week for four days, Tuesday 23rd April to Friday 26th April. Open again next Saturday 27th. And the puffins are back on the Isle of May for the new breeding season! We have a couple of these painted and printed wooden panels by Rachel framed in the gallery, inspired by the harbour here in Crail. 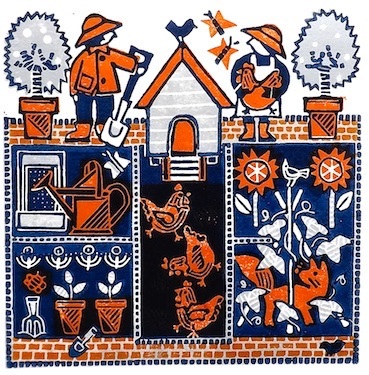 One of three new small prints by David of garden scenes - this one is called Beetroot, Birds and Bees ! A new edition of the Fulmars nesting on the cliffs overlooking the harbour here in Crail. 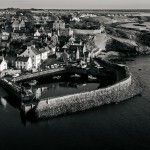 Crail Gallery will be closed for a few days, Tuesday 12th-Saturday 16th February inclusive. Sorry for any inconvenience and we hope to see you soon. New Prints almost dry! Shipping Forecast using old Wood Type with linocut. An edition of only three of each design. 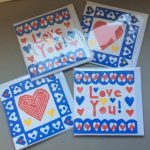 New Valentines Cards in the Gallery, four designs, hand printed..drop us an email if you would like one.....£5 each. 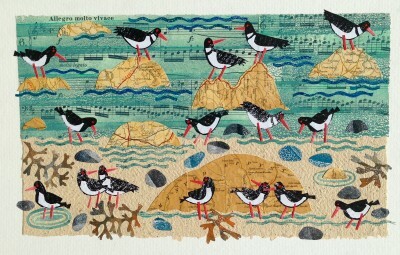 Collage of Oystercatchers feeding on the shore. New picture by Susie just added to the website. Unframed price £155 to include post and packing. 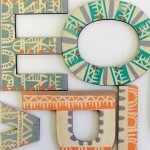 Many new unique collages have been added - check them out in Susie’s section under the heading .....Unique Collages! 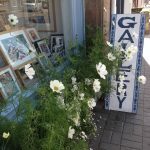 The Cosmos in the Gallery windowboxes have been a great success this summer, flowered for months.....difficult to see in the window at times but that’s ok! 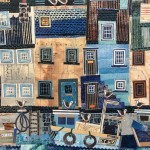 A detail from a larger collage by Susie showing the harbour at St. Monans. 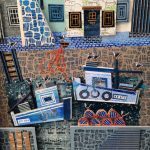 Blue Moon- this is a section of a larger 3D collage of St. Monans Harbour which Susie has recently completed. 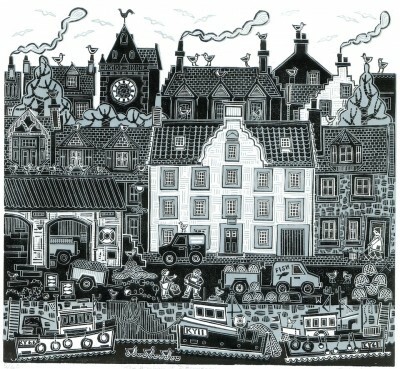 New work being added to the pieces on show in the Gallery here in Crail this summer. Closed for a few days…. The gallery will be closed for a few days, Wednesday 13th to Sunday 17th inclusive. We will be open again as usual on Monday 18th June. Look forward to seeing you soon! 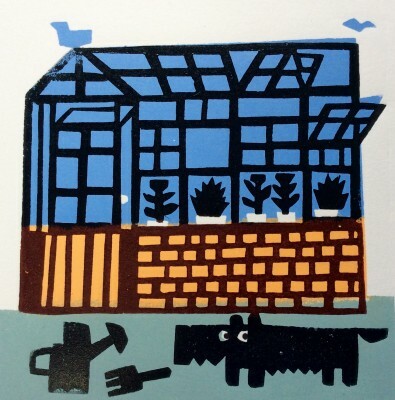 Susie has added some new linocut prints to the gallery for all you gardeners out there! Different colour ways are available. Two designs for now but more to come. We are showing a lovely new selection of black/white photographs taken by Matt Sim, another member of the Sim clan! Matt used his drone camera to take pictures of the harbours here in the East Neuk of Fife. Available for sale soon from the website here. Puffins are back on the May Isle for spring, at last. 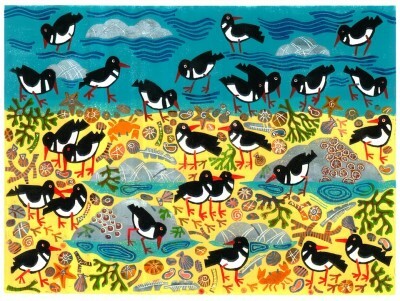 These birds are only on land for the nesting season, they live most of their lives on the sea. 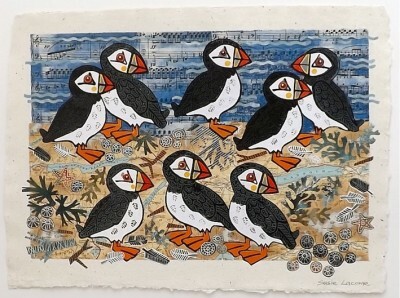 This is a new collage by Susie of these great wee birds. 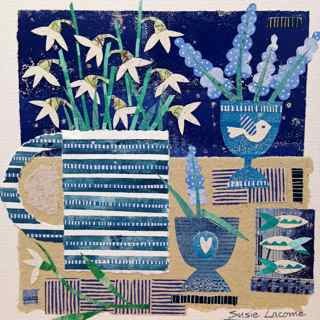 This linocut by Susie has recently been editioned in a new colourway, blue, grey and black.....quite different in mood from the original full colour version. David has recently been painting beautiful still life compositions on wood, look out for more coming soon. The first two have been added to our shop under paintings. 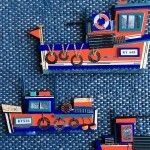 A section of a new piece of work by Susie, one of her 3 D collages in a box frame showing the Harbour at St Monans. 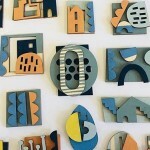 A mix of linocut, collage and a lot of balsa wood! 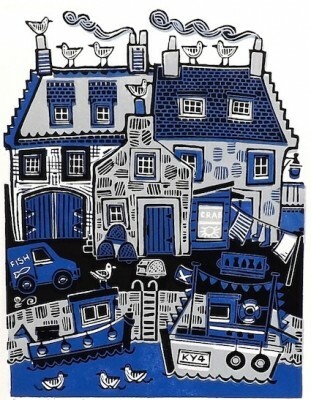 A new linocut print by Susie in shades of blue......showing the harbour light at Anstruther. 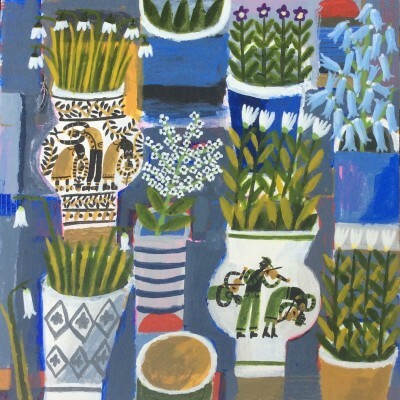 Rachel will be showing her work at The Hepworth Print Fair which opens on Friday 23 March to Sunday 25 March inclusive. 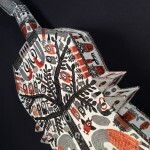 Do go along to see the work of many talented printmakers. 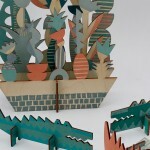 Rachel will be selling these printed plywood animals and window boxes along with her silkscreen prints. The Gallery here in Crail will be closed from Thursday 22nd to Monday 26th for grandparents to babysit Rosie! 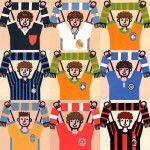 David has been busy over the winter adding lots of new football strips to his collection of footy fans. New strips include Inter Milan, AC Milan, Bayern Munich, Sweden, Real Madrid and a new Scotland Retro. 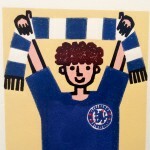 Find the new limited edition linocuts on David Sim - under footy fans. 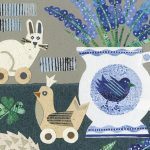 Rachel will be exhibiting a selection of brand new work at the Print Fair in Wakefield at the Hepworth Gallery this weekend, 2-4 March 2018. Lots of lovely stalls and artists work on show! Crail Gallery will be closed from Friday 22nd - Wednesday 27th December. Happy holidays to everyone and all the best for 2018 ! The Gallery will be closed from Wednesday 22 November for a week while we travel down to Yorkshire to help Rachel with the Hepworth Christmas Market.....and do a bit of babysitting duty for Rosie.....can’t wait! Rachel has been very busy making lovely things to sell on her stall at the Hepworth Christmas Market including these painted/printed wooden brooches. 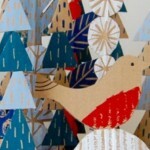 The market is open from Friday the 24th till Sunday the 26th of November at The Hepworth Gallery in Wakefield. 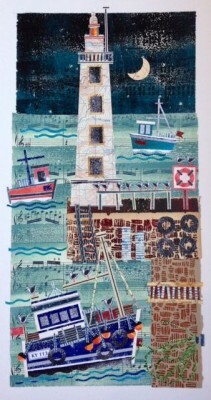 A new original collage by Susie of the harbour light at Anstruther. Lots of Oystercatchers feeding on the Shoreline at Crail today, enjoying the autumn sunshine. 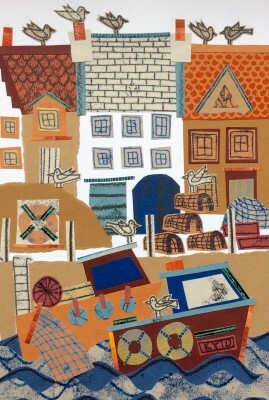 This is one of a couple of original collages by Susie on sale on the website. Welcome to all the new students at St. Andrews university in their red gowns ! 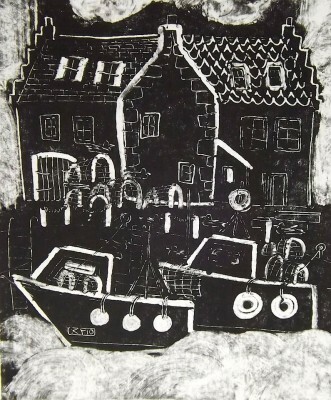 Crail Gallery has a few prints showing the students including this one of the Pier Walk. 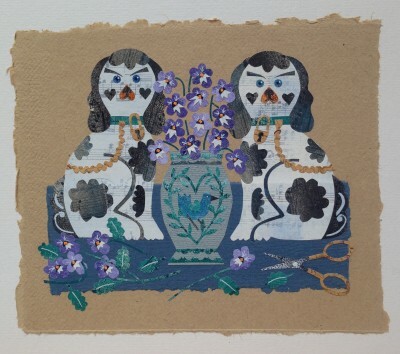 New Collage on Indian hand made paper of Two Wally Dugs with Purple Pansies. 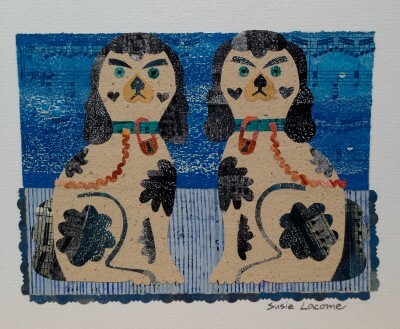 Two china wally dogs sitting on a striped background. Waiting for a new home! 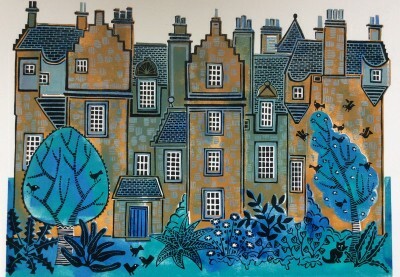 A new linocut of Kellie Castle near Pittenweem by Susie. Worth a visit to see the beautiful walled garden and Arts and Crafts interior. 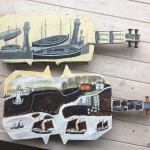 Constructed from cardboard and hand painted, David has made a selection of violins influenced by the work of Alfred Wallis. These are hanging in the gallery window to celebrate the East Neuk Music Festival 2017. 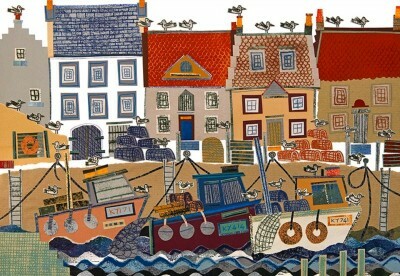 New giclee print by Susie from an original collage of the Harbour at Crail. The Crail Gallery will be closed next week from Tuesday 30th of May to Friday 2nd of June inclusive.....open again on Saturday 3rd. 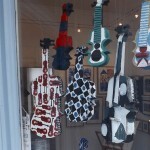 David has been busy making and painting violins again this year for the gallery window to celebrate the East Neuk Music Festival in June/July. All pieces will be for sale. 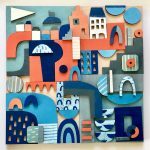 Rachel has been busy making new paper collages, will post them on the website as she makes them, two today and more in the pipeline, if baby Rosie allows her mum some time in the studio! 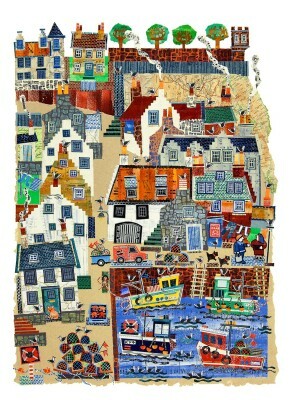 Susie has been working on new pictures for the gallery, collages in fabric with embroidered detail. Just back from the framers they are in box frames in solid oak. 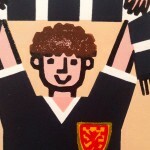 David has printed a new footie fan - Scotland in a retro strip! The gallery will be closed in December between the 23rd and 27th, we would like to wish everyone a Very Happy Christmas and all the very best for 2017 ! 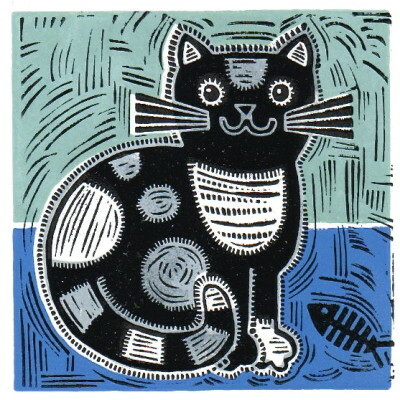 Great wee linocut by David Sim, new print. 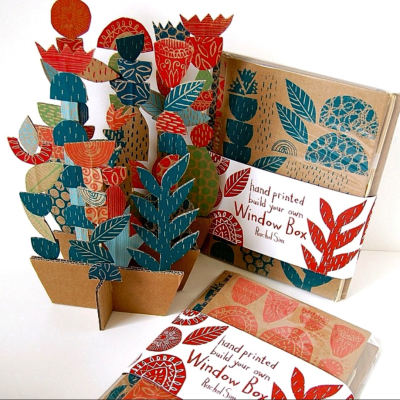 Rachel has hand printed these window box kits which make up into your own card sculpture which you design yourself. The kit contains all you need including easy to follow instructions and a photo of how the finished window box would look. The perfect gift for Christmas! £22 each which includes post and packing, just go to shop and find under window box. 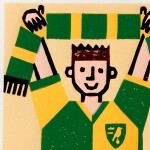 New Norwich football strip has been added to the selection. David has also just printed Partick Thistle, Kilmarnock and a new edition of Hibs for the footie fans in your life! 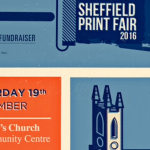 Rachel will be selling her prints again this year at Sheffield Print Fair on Saturday 19th November. Held at St. Mary's Church in Bramall Lane, Sheffield S2 4 QT. Open from 10am-4pm. 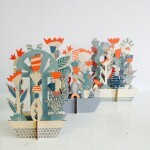 Lots of lovely new work for sale. 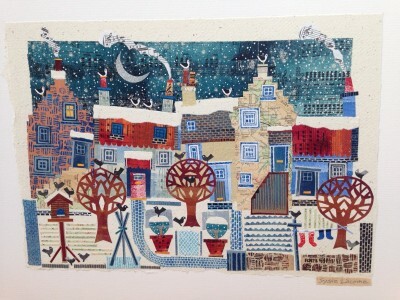 New winter collages by Susie available in the gallery and online. 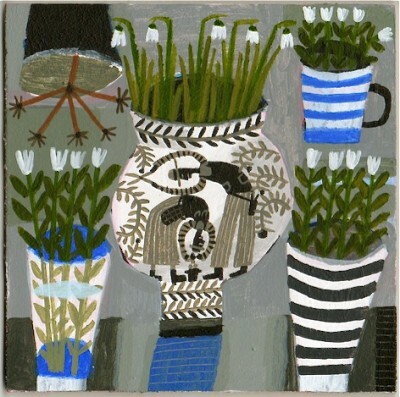 New Cards for sale in the Gallery. 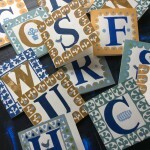 Hand printed linocut alphabet cards, no two the same! A selection of hand painted cardboard construction violins to celebrate the music festival here, 2016. 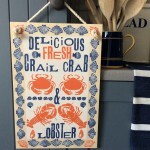 New Signs, freshly printed, onto plywood.Linocut and Silkscreen with cotton rope knotted loop, perfect for hanging in your kitchen. 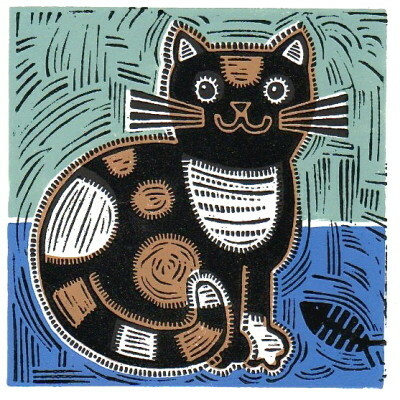 New colourway for the Calico Cat linocut by Susie available now in the gallery or online in the shop. Rachel will be selling her work including these new lasercut wooden letters at the Print Fair at the Hepworth Gallery in Wakefield this weekend, March 4th, 5th and 6th . 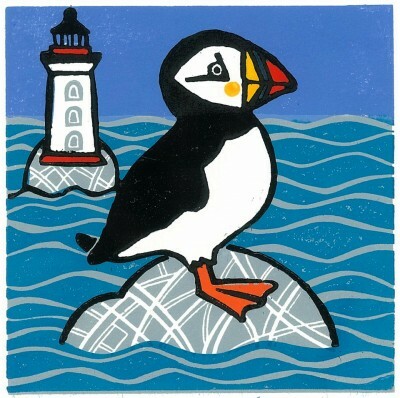 David has now added 20 new colour linocuts to the gallery. Find them for sale under FOOTY FANS ! 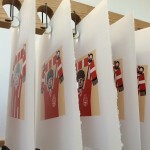 David has been busy printing limited edition linocut prints of football fans....a variety of strips will be available, coming very soon! 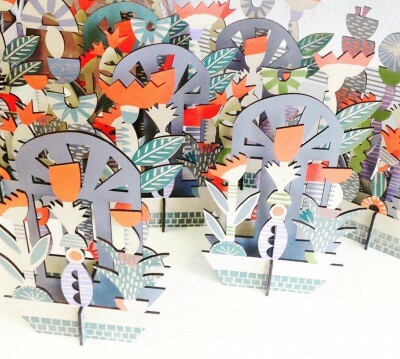 Rachel will be taking a workshop at the Yorkshire Sculpture Park in March 2016 where you will be able to decorate and print your own birch plywood plant holder to take home. I saw three ships go sailing by…. Susie has been busy making a flottilla of small fishing boats to use in her new 3D box frames showing the harbours of the East Neuk of Fife. 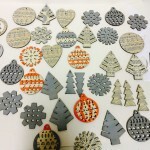 Rachel will be selling her work including these lovely new laser cut wooden decorations at the Hepworth Christmas Market this weekend. November 21& 22. 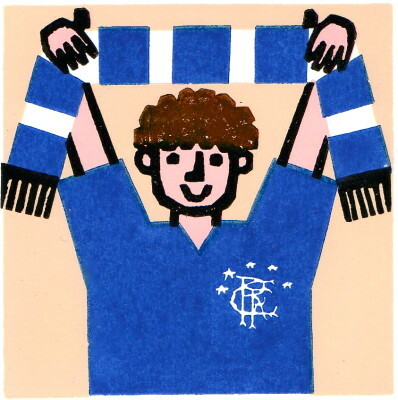 David has been busy printing lots of new football supporters with new teams being added all the time! Keep a look out for your favourite! 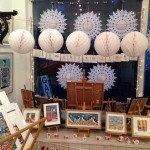 New 3D pieces by Susie appearing in the Gallery here in Crail, in time for Christmas! 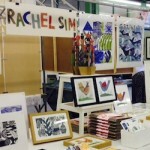 Rachel will be taking workshops for all ages in printmaking at the Hepworth Gallery in Wakefield. Most on a Christmas/Winter theme. 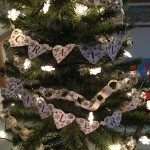 Go along and join her in making your own decorations. See the Hepworth website for more details. 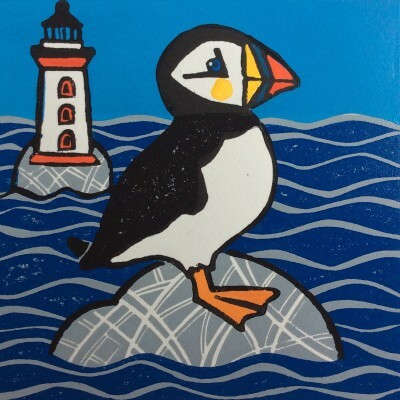 A new little puffin Linocut against blue waves by Susie. 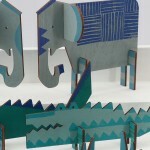 Three Grey Elephants with blue and orange. 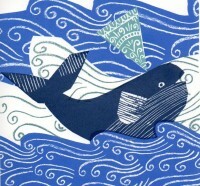 Another variation on Rachel's new Elephant Silkscreen Print. 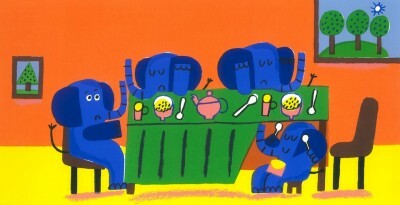 A new silkscreen print by Rachel of three elephants in a row on multi coloured backgrounds. 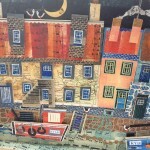 It's time for the Pittenweem Arts Festival again - starting the 1st Saturday in August until the 9th. We have a venue, 64 on the harbour at 24, Midshore and will be showing a selection of new work and prints. Come and say hello! 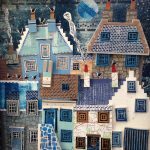 Rachel is taking part in The Art Market in the lovely Yorkshire town of Holmfirth on Sunday, 28th of June, do go along and see her most recent work. It will soon be Graduation Day for the St. Andrews students. 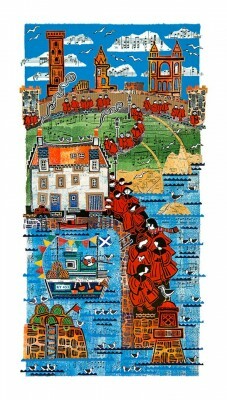 Crail Gallery has linocut prints and giclee prints showing the students in their red gowns. The perfect present for graduates and a lovely reminder of student days. 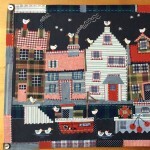 Rachel is teaching this weekend 6th and 7th June, at West Dean College near Chichester. 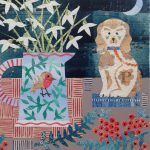 She will be demonstrating different methods of printmaking from mono print to reduction linocuts, a busy few days ahead! 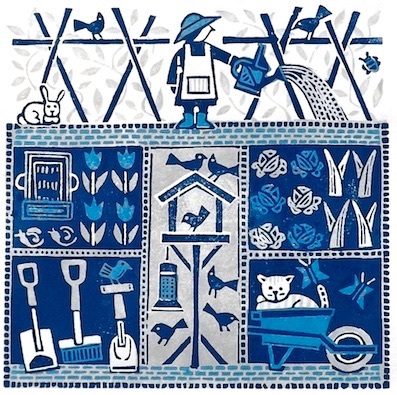 David has illustrated four children's books for Pan Macmillan using original silkscreen prints which we have for sale, perfect for decorating playrooms or kids' bedrooms. 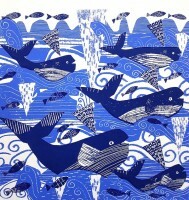 This is one of Rachel's new large silkscreen prints, available in two different colourways, all blues or blue with aqua. The season is here again for the puffins to arrive on the May Island for breeding, the only time that the birds live on land. 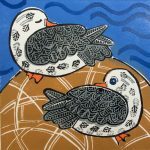 The gallery always has a range of prints and original collages in stock of these great wee birds, see here and here.